Persons looking on Weegee’s incredible photographs for the first time find it hard to believe that one ordinary earth-bound human being could have been present at so many climactic moments in the city’s life. 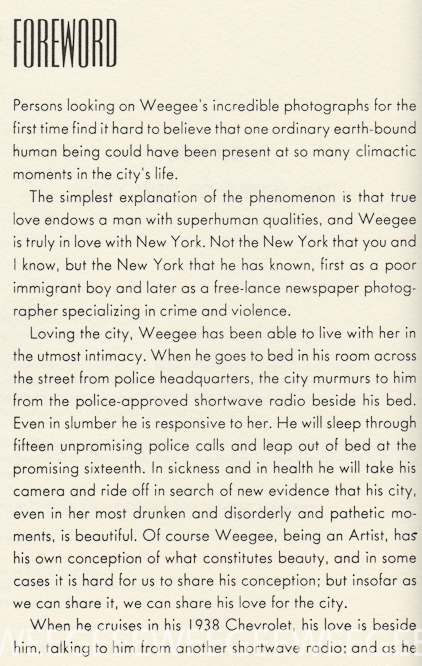 The simplest explanation of the phenomenon is that true love endows a man [or woman] with superhuman qualities, and Weegee is truly in love with New York. Not the New York that you and I know, but the New York that he has known, first as a poor immigrant boy and later as a free-lance newspaper photographer specializing in crime and violence. Loving the city, Weegee has been able to live with her in the utmost intimacy. When he goes to bed in his room across the street from police headquarters, the city murmurs to him from the police-approved shortwave radio beside his bed. Even in slumber he is responsive to her. He will sleep through fifteen unpromising police calls and leap out at bed at the promising sixteenth. In sickness and in health he will take his camera and ride off in search of new evidence that his city, even in her most drunken and disorderly and pathetic moments, is beautiful. Of course Weegee, being an Artist, has his own conception of what constitutes beauty, and in some cases it is hard for us to share his conception; but insofar as we can share it, we can share his love for the city. When he cruises in his 1938 Chevrolet. his love is beside him, talking to him from another shortwave radio: and as he listens to her he is also watching her, and he will stop to photograph the drunk asleep in front at the funeral parlor as further evidence of his love’s infinite variety. Weegee is a rather portly, cigar-smoking, irregularly shaven man who has seen and recorded a great deal of ugliness and disaster, but he remains as shy and sensitive as if he had spent his life photographing babies and bridesmaids. This, I think, is further evidence that he has been inspired not by a taste for sensationalism but by his love for the city and her children – especially the troubled and unfortunate ones, the kitten-loving ones who sleep on fire escapes in the summer. 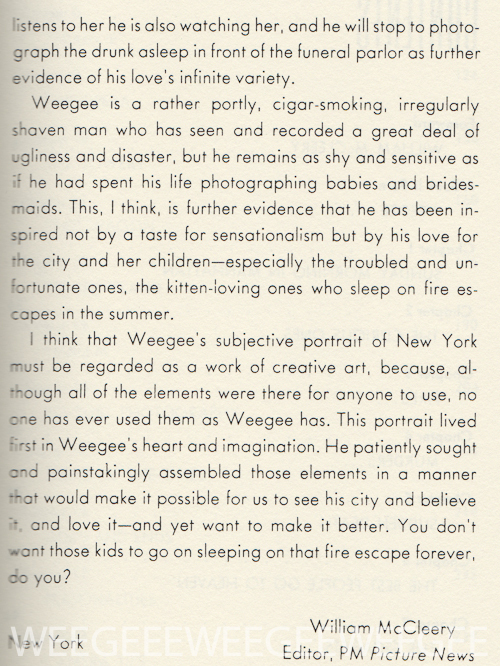 first in Weegee’s heart and imagination. He patiently sought and painstakingly assembled those elements in a manner that would make it possible for us to see his city and believe it, and love it — and yet want to make it better. You don’t want those kids to go on sleeping on that fire escape forever, do you?